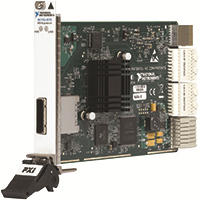 The PXIe-PCIe-837x kits provides remote control of any NI product with a cabled PCI Express x4 ("by four") connector from a x4 or higher PCI Express slot in your desktop or server PC through a fully transparent, high-bandwidth cabled PCI Express link. The PXIe-PCIe837x kits consist of a PCI Express board in the PC, connected via a x4 MXI-Express cable to a PXI Express module in slot 1 of a PXI Express chassis. The PXIe-8370 module, used in both kits, implements a PCI Express-to-PCI Express switch.